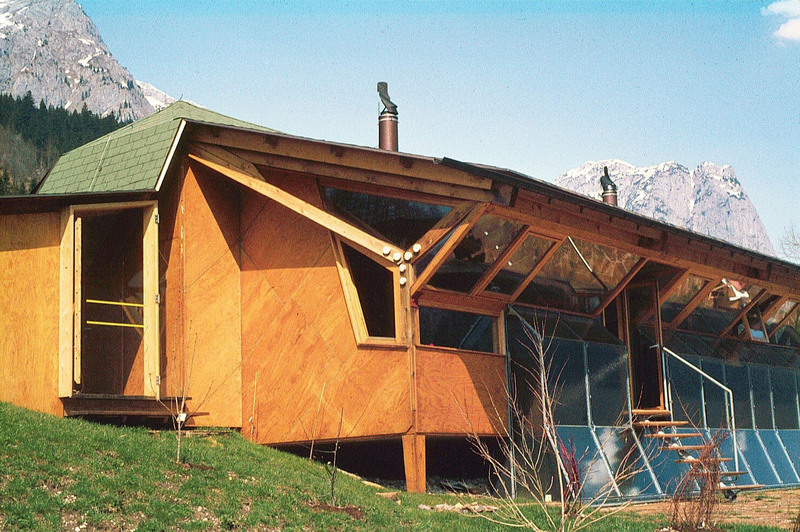 Since the mid-1960s, the Austrian architect Konrad Frey (*1934) has conducted research studies of solar utilisation, applied his design knowledge in a series of sun house prototypes, and designed the first Austrian Solar House in 1972. The unifying theme is to rethink modern premises, like functionality and flexibility, environmental control versus responsive, well-tempered environments, in terms of regional contingencies and sustainable resource use. His pioneering work comprises of sundomes, suit-able service modules, greenhouses, infrastructural systems, sun houses (Fischer House at Grundlsee/Styria, Zankel House in Prévessin/Geneva), and the Solar Houses I–III, among others. Frey’s theoretical investigations at the Graz Institute of Environmental Research and international alliances with theorists (CERN, Arup, TU Vienna) are widely published (1989 manual Handbuch für Energieberater) and initiated the Austrian Energy Advise Service. Yet, until now Frey’s work has been identified with fundamentally different assessments, mainly focusing on the avant-garde of the Graz School, post-modern vocabulary, or critical regionalism. However, highly relevant contributions to the global discourse on solar architecture and environmental research have not been operationalised in previous examinations. The planned project will fill this gap, by scientifically processing and evaluating unpublished sources and new data, measuring and re-conceptualising the energy performance of Frey’s prototypical solar houses, in order to issue the catalogue raisonné with critical commentaries and a digital database (Part 1). Second, the research will identify key narratives and analyse Frey’s design knowledge in order to create an intellectual biography of Frey, focusing on his scientific approach towards architecture, his connection to modern narratives, the history of solar ideas, and the instrumentalism of the environmental discourse (Part 2). The research project will be grounded on an interdisciplinary approach using research methods of both the humanities and technical sciences, such as the theory and history of architecture, cultural studies, the sociology of technology, and building physics. The planned research project will expand the body of knowledge of the disciplines mentioned above in order to provide highly relevant insights into Frey’s significance within the architectural discourse. The prime focus will be based on Frey’s exploring the viability of using solar energy, developing solar prototypes, and promoting a new resource policy. The broader impacts of the expected results will apply to the sphere of human ecology, global resource control, and environmental policy strategies.